GEO Field Service has well over 110 years combined field experience in heat exchanger repairs and service. We are available 24/7 and can respond within hours to perform cost effective on site repairs. GEO has crews on call to service your needs, after hours and weekends are no problem for our team! All GEO Field Service employees hold current OSHA and TWIC cards, DISA drug testing and DISA back ground checks. GEO Field Services can offer a turnaround crew on site during your turnaround. The Field Service crews have stocked tool/consumables trailers for all you repair needs. We offer turnaround services that include re-rolling I-Tube leaks to a full re-tube, as well as blind to blind. GEO Field Service offers a full line of re-tube as well as partial re-tube with welded or rolled tube ends. GEO Field Services has many years of experience in the re-tubes of fin-fans and surface condensers. GEO Field Services offers on-site re-rolling with all the tube rolling expanders and consumables needed in stock. We stock size ranges from 5/8” OD tubes any gauge to 1 ¼” OD tubes gauge. GEO Field Service offers individual tube testing with the G-150 tube testers. Individual tube test pressure can range from 10 PSIG to 75 PSIG. GEO Field Services stocks tube testing seals in sizes ranging from 5/8” to 20 ga to 1 ¼” x 20 ga.
GEO Field Services offers pulling / extraction of sample tubes. After the sample tube is pulled, a pocket “dummy” tube in installed or replace with new tube. We stock ¾” and 1” x 12 ga SA-179 carbon steel and brass pocket “dummy” tubes. Other sizes and material type can be fabricated upon request. GEO Field Services holds both the ASME “U” and “R” stamps and has ASME code certified field welders. 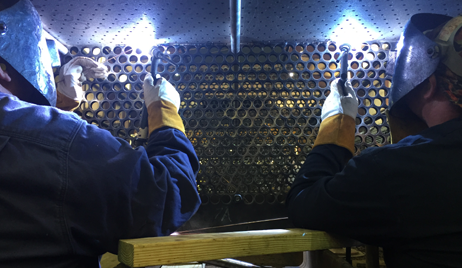 We can handle your code and non-code welding jobs from small tube to tubesheet weld repairs to replacement nozzles. All welders are ASME code tested and certified.